To honor James Brown on his death anniversary this past Christmas day, I decided to put together my version of a mix dedicated to all things JB! A funny story behind this was when I was on my way to midnight mass with family, playing some James Brown in the car. My mom said all his songs kind of sound the same. I was like, NOOOO they don’t! hahah. So I played one of his jazzy tracks for her, and she was surprised and enjoyed the song. I felt maybe a lot of other people haven’t heard his less known tracks, so this motivated me more to share why I thought he was such a great artist. Hip-Hop dance was the first style I learned growing up. I really enjoyed the music and as I got older, I discovered the truth about SAMPLES! It blew my mind that a lot of the hip-hop music I danced to growing up, were a lot of James Brown sampled tracks! I think this is also the reason why locking is so fun to me, is because after discovering a lot of the FUNK though James Brown’s music, I was able to put a dance that felt right when listening to his music. Anyways here is a whole 2 hour JB medley set. I tried to put something in here for everyone from dancers of any style, to djs and music heads. I couldn’t even find room to put ALL of my favorite JB tracks, (a 2 hour set is long enough! haha). Contains everything from his popular songs, to older/rare stuff. Also included JB related artists, remixes and covers, to a hip-hop sampled section medley, even some salsa and jazzy tracks. It’s no wonder he was the hardest working man in showbiz! There are tons of other James Brown mixes out there that are dope. This mix is my particular approach coming from a dancer’s perspective. I hope you enjoy this as much as I did making it! JAMES BROWN FOREVER!!!! 1. Check to see if you have the track order correctly. 2. Highlight all the tracks in iTunes and right-click > Get Info > Options and make sure you have “Gapless Album” selected as YES, and “Remember Position” as NO. If it still sounds funny, shoot me an email. Otherwise, you can always just download the whole mix as a single mp3 file through the player below. i can't play it, help! salut dynamite soul je cherche les titres du roi J.B sur votre cite! je cherche les titres des chanson! thanks for the support! much appreciated! THANK YOU! This is sooooo dope! Great blog and mix. Peace. 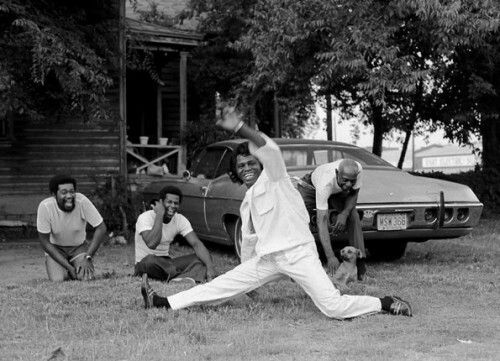 I grew up dancing in the late 70’s and never realized just how awesome James Brown was. Never knew many of the funky tracks in here were his!! So I can see where your mom was coming from. I’ve got such an appreciation of his great talent much too late. Better late than never! Thanks for this treasure! It’s time to dance ALL NIGHT LONG! !